When preparing to address difficult, “touchy” topics such as race, politics and religion, one must always be cognizant of those who may become offended due to the nature of the conversation. This triumvirate of issues has caused devastation worldwide, ruined personal & business relationships and has sparked a myriad of wars throughout the course of recorded time. The truth becomes uncomfortable; and when dealing in that truth, one must understand that the facts do not cease to exist because they are ignored. When analyzing the headline photo caption, imagine the mind shifts and wide range of emotions exhibited based on one’s race and cultural upbringing. For the African-American, the reaction is often swift and definitive. Typically they’re in immediate agreement with the statement. I mean, how could they not approve of the blunt honesty of that sentiment expressed by @Adonissound (via Twitter) with all the historical evidence at our disposal – chattel slavery, Jim Crow, redlining, sharecropping, the Black Codes, the formation of unions, the Prison Industrial Complex, etcetera and so on. To those of European decent, they may find absurdity in the assertion. Their replies may consist of the argument that the playing field is level for all Americans; that slavery was a mere moment in the United States’ dark yet illustrious past which has been rectified by the adoption of the Emancipation Proclamation, the passage of the 13th and 14th Amendments and the passing of the Voters, Civil and Housing Rights Acts during the 1960s. To compare serious social issues to that of paranormal or supernatural activities is ridiculous and an insult to the public’s intelligence. That this opinion further drives the narrative of a racial divide which instigates disharmony amongst the races. But in a country where White Americans are the racial majority, with a 77.7% share of the U. S. population (which includes Hispanics who described themselves as White based on a 2013 Census Bureau report), is this a case of cognitive dissonance; that in which one race does not understand the magnitude of the chain events that has led to the disenfranchisement of another; or simply a case of the “majority” race being oblivious to, and in many cases having no disregard to the advantages they’ve secured by controlling all the industries, utilities, media and resources? How can one recognize a problem when they have no idea or understanding that one exists? Race is a social construct that artificially divides people into distinct groups based on characteristics such as physical appearance (particularly color), ancestral heritage, cultural affiliation, cultural history, ethnic classification, which serve social, economic, and political needs of a society. We can all agree that no child is born understanding the concept of racism, discrimination or oppression. Racism is a learned behavior that is observed, implemented and experienced by the parties involved; no different than a child being taught the fundamentals of the world’s monetary system. At first, a child sees a dime, quarter or nickel as a shiny object; holding no particular value other than what is pleasing to the eye. Only after being taught its significance does paper currency become more appealing and desirable because of how it’s worshipped and the connotation that the more strips of legal tender one possess, the growth in one’s esteem; the more that can be purchased; the higher the adulation received by bearing large sums of it. The possession of coins is seen as insignificant; not understanding that with the accumulation of a large number of them over time, one’s wealth can be equivalent; the process is only slower. Race is regarded in the same fashion. If a family runs a corporation, and then allows an outsider to join their ranks as a consultant or employee, any complaints addressed with those with controlling interest would be seen as frivolous, because to them the company has always run in that fashion and any underlying issues were brought about by the disgruntled employee for not having an understanding of how things are. That’s why majority rules; and with race, as with big business, each rules on the concept of those in power establish the guidelines in which everyone should abide by. Accepting those parameters, let’s discuss the phenomenon’s that makes the headline statement true. During the month of March 2015, according to NUFORC (National UFO Reporting Center), the ten (10) states with the highest number of UFO sightings since 1998 include the following – number of sightings to date in the state, last city reported, date and race ratio (White to Black) according to the latest U. S. Census from abcnews.go.com: California – 11,202 (Ladera Ranch; March 22, 2015; 69% to 1%); Florida – 5,113 (Deltona; March 23, 2015; 54.5% to 9.7%); Washington – 5,004 (Everett; March 24, 2015; 81.05% to 3.35%); Texas – 4,359 (College Station; March 25, 2015; 77.2% to 6.8%); New York – 3,837 (Bronx; March 22, 2015; 45.8% to 43.3%); Arizona – 3,212 (Green Valley; March 23, 2015; 91.9% to 0.3%); Pennsylvania – 3,142 (Philadelphia; March 25, 2015; 45.5% to 44.2%); Ohio – 2,907 (North Ridgefield; March 22, 2015; 92.6% to 1.4%); Michigan – 2,451 (Vicksburg; March 24, 2015; 93.6% to 0.5%); and North Carolina – 2,273 (Pfafftown; March 18, 2015; 90% to 8%). In cities other than the Bronx, New York and Philadelphia, Pennsylvania, where the populations were diverse, everywhere else the ratios reflected a figure where White Americans were the distinct majority. Where grievances lodged by people of color could be easily overlooked as bellyaching and whining. The areas in which Sasquatch, or the creature commonly known as Big Foot, has been sighted also have eerie parallels to those of the UFO findings. Areas in which African-Americans would not normally frequent to encounter such a beast include Mt. Rainier in the State of Washington; the Muir Woods in the State of California; Ecola State Park in the State of Oregon; Drift Peak in the State of Colorado; and Shawnee National Park in the State of Illinois to name a few. 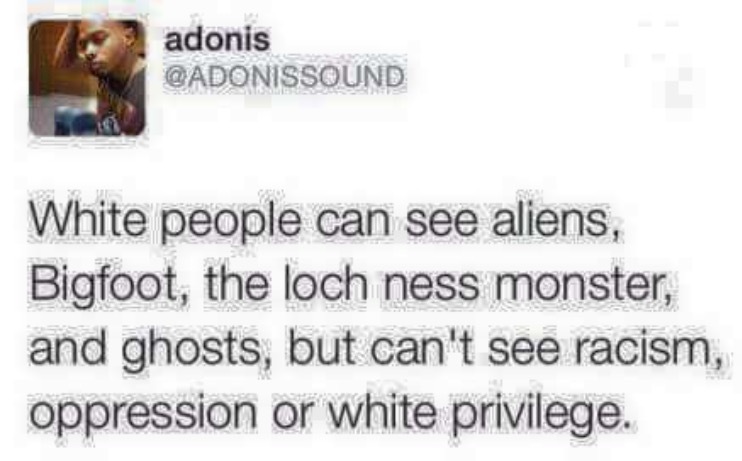 And there shouldn’t be any argument about the Loch Ness, considering the monster is thought to lurk in the waters of Scotland where the ratio White to Black is 96% to 0.6%. Using these figures as a barometer, albeit a small sample, the caption defines that a demographic could more readily identify with the existence of mythical creatures, specters and celestial beings, than to the plight of those that weren’t considered their equal. I’mma play the devil’s advocate on this one. So there’s an online petition asking for the removal of the Confederate flag fueled recently by the shooting in Charleston, South Carolina. In the south, for some, the flag represents a symbol of pride. When seen, it’s a rally cry for those that felt oppressed by a government (the North/Union) who destroyed their families’ livelihoods over a century and a half ago. For others, it represents a beckon of hate. A constant reminder of days past where people of color were tormented and tortured; entrenched in history, with the burning cross (imagine that), as a sign of the danger to come for those whose hue, sexual orientation or religious background were different from that of their oppressors. Whether carried by hooded rogues or waving in an afternoon breeze on the back of a Ford F-150, gun-rack in tow, it instilled fear and horror. It’s symbolizes the Black holocaust here in a country where one of the slogans are “Give us your poor, your tired, your huddled masses longing to be free.” Does removing the flag from state buildings, tailgating events and other venues resolve the root causes of racism? The answer for some is it’s a step in the right direction. It would mean that as a society we’re making progressive steps by attempting to solve a problem deeply woven in the annals of American history. The real answer is “No!” As a material object, it doesn’t change the psychology of the individual enveloped in its clutches. It’s something which is embedded as a result of exposure and practice; it’s a behavior that’s taught and the flag only serves as a reminder of a cause, not its intrinsic value or intent. Members of the Klu Klux Klan no longer walk around wearing their robes and other garments in reverence to their agenda. They pose as your doctors, attorneys, pediatricians, police officers and teachers. Though the fabric may be buried underneath valuables in a basement or hanging near trinkets in an attic, it’s a mindset that goes unchanged by judgment, public opinion or common sense. 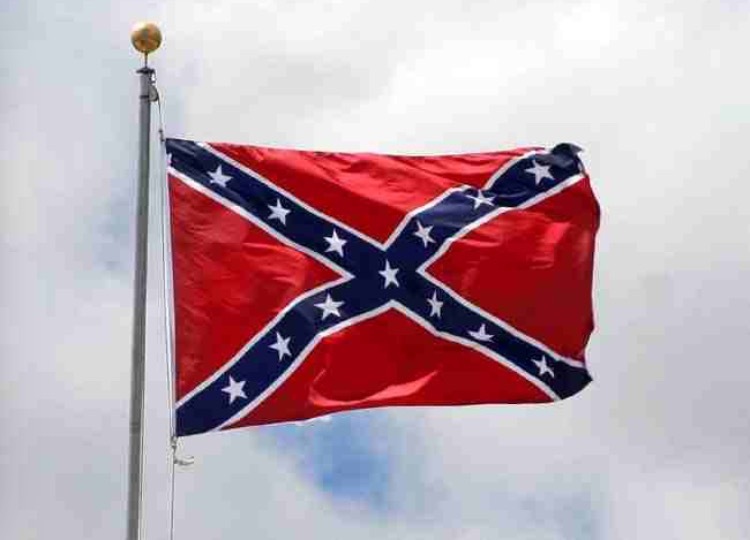 If you’re willing to remove the Confederate flag, be willing to remove the flag of this very country because the foundations are virtually the same. A mere search through history will reveal the methods by which the United States was able to establish, expand, maintain and continue its dominance as a global power. I say keep the flag; let it serve as a reminder of the atrocities that have occurred under its banner. Keeping those that are aware of its history to be ever mindful of the smell of burning buildings, decomposed corpses, shattered windows and broken dreams which occurred and continues to do so while it flies. Allow it to summon the strength and courage necessary to overcome the adversity associated with its colors, stars & bars. 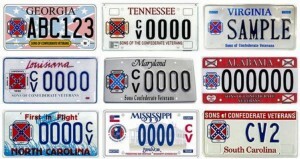 Let people bask in its splendor as a reminder of the loss the South suffered during the War on Northern Aggression (The Civil War). It’ll be contradictory to remove generations of tradition, be it right or wrong, because it doesn’t adhere to the norms of society. No different than the Native Americans or the Africans that arrived here via the TransAtlantic Slave Trade being stripped of their culture, religion & beliefs. 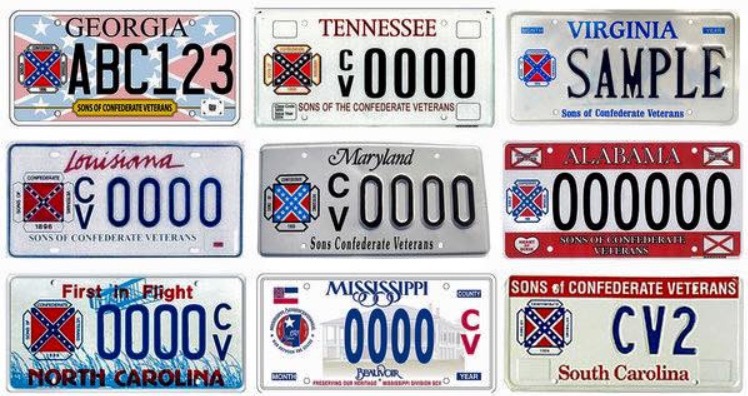 Changing the names and uniforms of the Ole Miss Rebels, stopping the sales of automobile license plates or removing the red bars from the State of Florida’s flag (which represents its time in the confederacy) won’t change the underlying issue. Racism, though enhanced by signs, symbols and images, is an inherent practice that is taught and instilled psychologically. Until the thought process changes, the removal of objects is only a superficial attempt to alleviate the issue. If that were the case, the existence of a divine being that can relieve the world of its ills and solve individual suffering wouldn’t be praised on a daily basis.